After thrashing Sri Lanka in three-match Test series by 1-0, high spirited Indian squad suffered a humiliating loss to Sri Lanka in the first One Day International match of three-match series at the Himachal Pradesh Cricket Association Stadium in Dharamsala on Sunday. Other than the former Indian skipper Mahendra Singh Dhoni no other batsman from Indian side manage to impress Islanders with their batting skills. Suranga Lakmal with his bowling skills managed to rattle the men-in-blue. The Indian batting line-up collapsed on the Dharamsala stadium at the score of 29-7 and only MS Dhoni manage to score more than 50 runs. Dhoni scored 65 runs after facing 87 balls. In his inning, Dhoni hit 10 fours and two sixes. With his batting in the first ODI, Dhoni managed to shut his critics who were questioning his place in the Indian squad and in the same match the former skipper also managed to maintained his hugely impressive record of reviewing decisions correctly on the Decision Review System (DRS). In 33rd over when men-in-blue was batting and Jasprit Bumrah was rapped on the pads with a delivery from Sachith Pathirana and umpire was convinced that he was out, then even before the umpire could have declared him out Dhoni asked for the review and with his awareness, the fans of the wicket-keeper batsman were highly impressed. The review for Bhumrah just now, proved once again, why is #MSD such an asset even now! 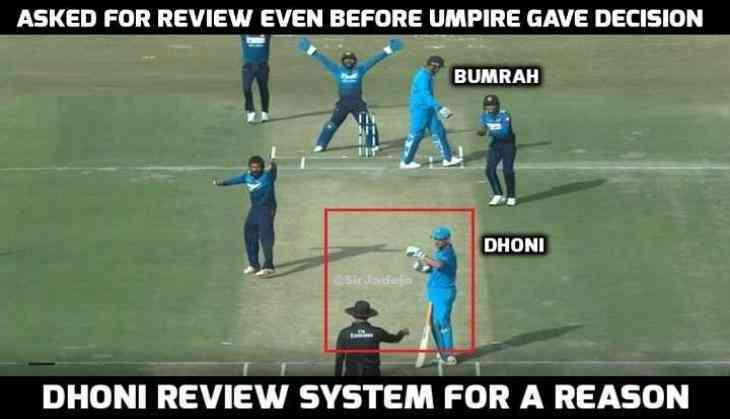 It's high time to change DRS from Decision Review System to Dhoni Review System!!!!! How can a man be this accurate... #MSDhoni for a reason!! !